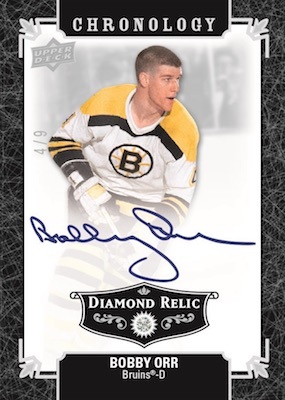 A brand that NBA collectors may remember from the 2000s, UD Chronology starts fresh with NHL fans in 2018-19 Upper Deck Chronology Hockey. Every four-card Hobby box includes at least one autograph. Although a new hockey set, the Chronology Vol. 1 release works in a lot of old. Old players, that is. Featuring UD's new deal with the NHL Alumni Association, the lineup features a strong assortment of former greats. Chronology Vol. 2 with current and retired stars is planned for the summer of 2020. 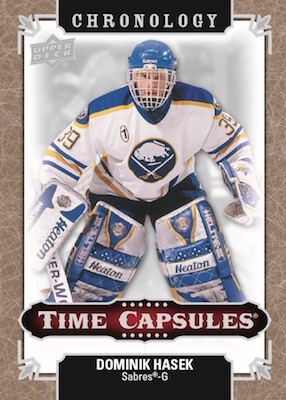 2018-19 Upper Deck Chronology Hockey keeps things pretty limited as the base set is capped at exactly 222 copies. These cards combine with the 0° Celsius (1:3 packs) insert to average one per box. Packing a little extra, the Time Capsules inserts are rip cards with minis inside. This 50-card set includes Time Capsules Base Variant Tier One (1:3 packs) and Tier Two (1:32 packs), plus Gold (#/25) and Black (#/15 or less) parallels. Possible pulls waiting inside the Time Capsules include one of the 192 Canvas Mini (#/60) cards, as well as Mini Blank Backs (hand #'d to 3) and Mini Black Autographs (#/30 or less). The Canvas Masterpiece Original Art (1/1) cards are another chase in play. As Upper Deck loves to do, there are also some TBD surprises. 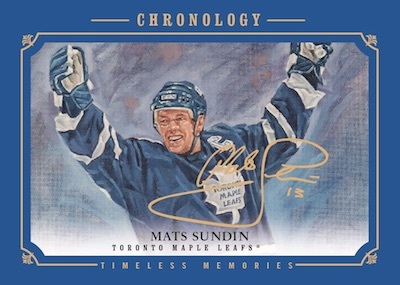 With at least one autograph guaranteed and as many as three possible per box, the 2018-19 Upper Deck Chronology Hockey checklist offers several signature lines. 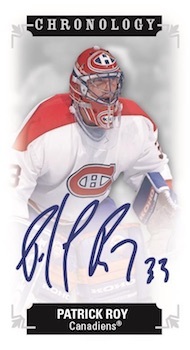 The Franchise History Autograph (1:10 packs) parallel contains up to 300 cards displaying team-based prefixes. "Key teams" have 12-20 autographs apiece. The base set adds Premium Gold Autograph, Premium Gold Memorabilia and Premium Gold Autograph Memorabilia parallels numbered to 25 or less. Additional signed inserts consist of Canvas Autograph (1:7 packs), with Red (1:35 packs), Green (#/10) and Black Border (1/1) versions, along with Canvas Red Border Autograph Memorabilia (1:65 packs), Canvas Masterpiece Autograph Tier One (1:19 packs and Tier Two (1:85 packs). The 50-card Masterpiece set also has Red (#/25), Green (#/10 or #/5) and Black Border (1/1) parallels, plus Red Border Autograph Memorabilia versions for the artistic inserts. Multi-signed options take the form of Dual Autographs (#/25), Triple Autographs (#/15) and Quad Autographs (#/10). 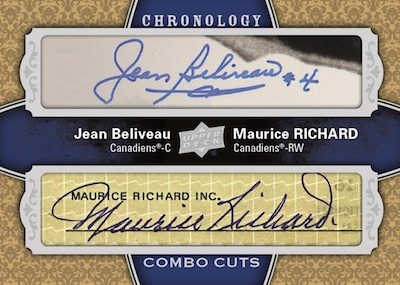 Among the most elusive pulls in the Chronology, Combo Cuts (1/1) displays two cut signatures on the same card. The numbered 1 in a 100 line works with Autograph, Memorabilia and Auto Relic cards, while the inner case-hit Diamond Relic insert offers Base (#/36) and Autograph (#/9) versions. 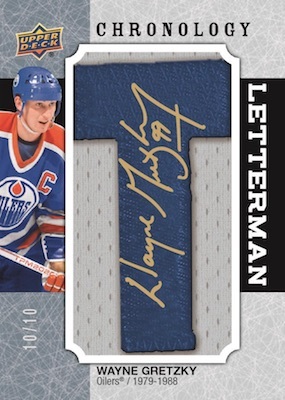 Closing out 2018-19 Upper Deck Chronology Hockey, collectors can expect approximately four to six Letterman Patches cards per inner case. Numbered to 35 or less per letter, Upper Deck also revealed that 90% of the set is signed. Around 90 Hall of Fame players headline the 200-card lineup. Disappointed with this. I was hoping to get a real set with lots of retired players, instead it’s just another overpriced memorabilia delivery system. The only thing worse then all of these high end, insert only sets that UD is making way to many of these days is thinking that a neck beard actually looks good. All these sets are is basically just an autograph delivery system with a gambling aspect built in. You shell out several hundred dollars and hope that you will pull one of the very few cards in the set that are actually worth that kind of money. But of course most people end up with about $30-60 worth of cards of players they don’t collect. I can’t wait for the day that UD is no longer the exclusive rights holder for NHL cards.